Riding New Zealand and living the dream! Want to experience New Zealand's mind-blowing scenery and some of the world's best motorcycling roads? Need a top bike, best advice and quality service? Look no further. 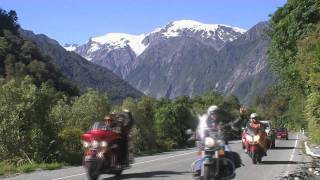 Specializing in luxury motorcycle touring and rentals, we operate just 25 mins from Christchurch, meaning you don't start from a busy city, you get to enjoy the quiet inland scenic route instead. Prices are competitive, yet prestige & quality are our main focus. Included: Full luggage, insurance, roadside assistance, free Christchurch airport and city transfers to base, New Zealand maps, familiarization ride and much more. Members of the Rental Vehicle Association, our expertise, guidance, patience and advice will guarantee your motorcycle adventure of a lifetime!